Australian Pete Shmigel argues that the suppressed traumas of distant and recent history continue to shape Ukrainian society negatively and are as big an obstacle to progress as more commonly discussed problems like corruption and the ongoing hybrid conflict with Russia. Is today’s Ukraine suffering from a collective case of post-traumatic stress disorder? 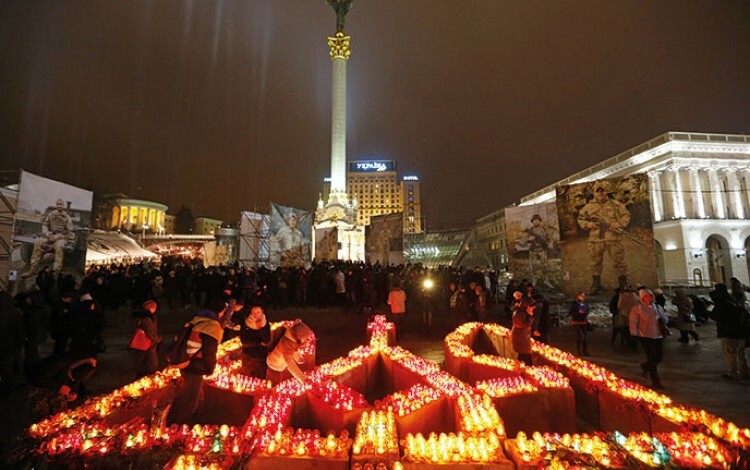 Mourning on Maidan: Ukrainians remember those killed during the Revolution of Dignity. Centuries of trauma continue to shape contemporary Ukrainian society - but how can this issue be best addressed? Just as individuals are subject to mental illness and emotional crisis, so too are organisations, businesses and entire nations. When enough members of a nation go through a common set of stressors, it is more than likely they will respond in some common ways. Ukraine, in my view, is suffering from a collective form of post-traumatic stress disorder (PTSD). While some of its citizens – returned soldiers, internally displaced people and those who witnessed violent events on the Maidan – may be more susceptible, it is probable that because of their common trauma experiences, millions of Ukrainians have some level of PTSD even if they do not realise it themselves. What are these traumas and what is the evidence of their impact? With regard to trauma, there are both historical and contemporary examples. Ukraine lost millions in an early 1930s artificial famine designed by the Soviet authorities to crush its national spirit, and yet the country is still in the process of truly recognising this fact. During World War II, Ukraine lost millions more, but then largely focused on celebrating the defeat of Nazism rather than the war’s horrific human toll. During the Soviet era, people felt forced into compartmentalisation and suppressing the most significant parts of their lives as their human rights were systematically denied. A moral code based on “survival of the fittest” took hold and still permeates some circles today. Across the post-independence era, Ukrainians have experienced the “obvious” pain of the war in the east and the deaths on the Maidan. Millions of Ukrainians also feel a particular personal pinch at the everyday injustices they face. The word “corruption” as used by many Ukrainians, whether it is in business or general conversation, seems to have taken on a broader meaning that signifies a general dissatisfaction with so much of what life is dishing up. For all their stoicism, their extraordinary capacity to laugh or sing away so many problems, and the very productive roles that family, enterprise and church continue to play in this country, Ukrainians nevertheless need to admit that impactful events inevitably have an impact. These impacts take the form of PTSD symptoms including heightened anxiety, strong irritability, angry outbursts, lack of concentration and patience, low levels of empathy, sleeplessness, avoidance and flashbacks. It is little wonder many Ukrainians have a hard time feeling hopeful or optimistic about the future. It is no surprise that migration rates are as high as they are. A key feature of PTSD is a reduced capacity to assess the risk of situations appropriately. Risks are typically either underestimated or overestimated because the PTSD brain, at both the individual and national levels, does not function with the necessary clarity. Two examples spring to mind. It took Ukraine four years to acknowledge that it was at war with Russia even as 10,000 people died. Meanwhile, people tend to view every protest or demonstration, whether it involves 100 people or 100,000 people, as a failure of the state. This poor judgement, often expressed in the form of intense cynicism, is regularly exploited by Ukraine’s very real and non-imaginary enemy. Putin expertly pokes a stick into Ukraine’s open wounds. When traumatic impacts are not acknowledged and their PTSD symptoms are not actively addressed, or indeed, when they are largely denied, they leak to the surface as different forms of a toxic emotional sludge. Very sadly, Ukraine has among the highest rates in Europe for suicide, alcoholism, drug addiction and domestic violence. These are all perverse forms of self-medication against PTSD through either self-inflicted or lateral violence. To the PTSD sufferer, they represent a logical way out, a way to numbness, or a way to relieve suffering through extra adrenalin and cortisol. Like many mental health conditions, PTSD is not easily cured, but we do know that it can be managed and that people (and organisations, businesses and nations) with PTSD can make great contributions. If nothing else, they become wiser for their tough experience, but it takes time, rest, structured intervention and healing. Central to recovery is accepting that there is an issue and actively choosing a positive management plan. Without the self-awareness of this first step, it is very hard to go further. Denial is a literal killer. There is much discussion of Ukraine’s demographic problems. But fixing a problem, as Einstein masterfully argued, requires a very accurate definition of the problem. Ukraine’s leaders and decision makers need to deal not with the symptom of people leaving, but with the deeper emotional causes: there is little healing and acceptance in place to keep people in Ukraine. This is an amazing nation. It has an enviable culture and capacity for survival but Ukraine’s future should not remain the slave of past and present pain. In order to flourish, reform is not enough. Ukraine must choose to heal actively and assertively. That responsibility lies not only with its current leadership, but in the daily choices each of us makes on the streets of Kyiv, Konotop, Kryviy Rih and all Ukraine’s cities and villages. Ukrainians need to forgive themselves, to forgive others and to forge ahead positively. About the author: Pete Shmigel is the former CEO of Lifeline Australia, a suicide prevention service. He has also served as an advisor on social policy to many Australian Ministers and Premiers, and as a social pollster. A frequent visitor to Ukraine, Shmigel is currently a guest of the Ministry of Health helping to scope the development of crisis support services in Ukraine.